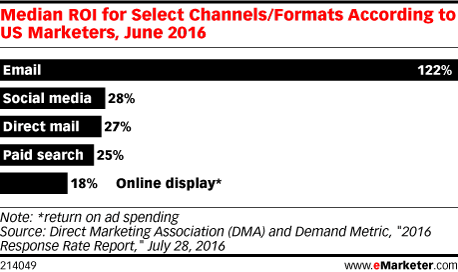 Data is from the July 2016 Direct Marketing Association (DMA) and Demand Metric "2016 Response Rate Report." 714 US marketers (322 complete and 382 partial responses) from a variety of industries were surveyed online during April-June 2016. Respondents were from B2C companies (45%), B2B companies (40%) and mixed B2B and B2C companies (15%). Respondents identified their company type as marketer (63%), agency (16%), supplier (10%) and other (11%). Respondents identified their annual revenues as $10 million or less (42%), $11 million-$25 million (15%), $26 million-$100 million (14%), $101 million-$500 million (11%), $501 million-$1 billion (5%) and over $1 billion (14%).